Tag Archives for Stampin’ Up! For July, the SWAT Team (Stampers With ATtitude) challenge revolved around all of us using the same punch – Stampin’ Up!’s retired Blossom Builder Punch. And, as always the team put on their creativity caps and rose to the occasion. 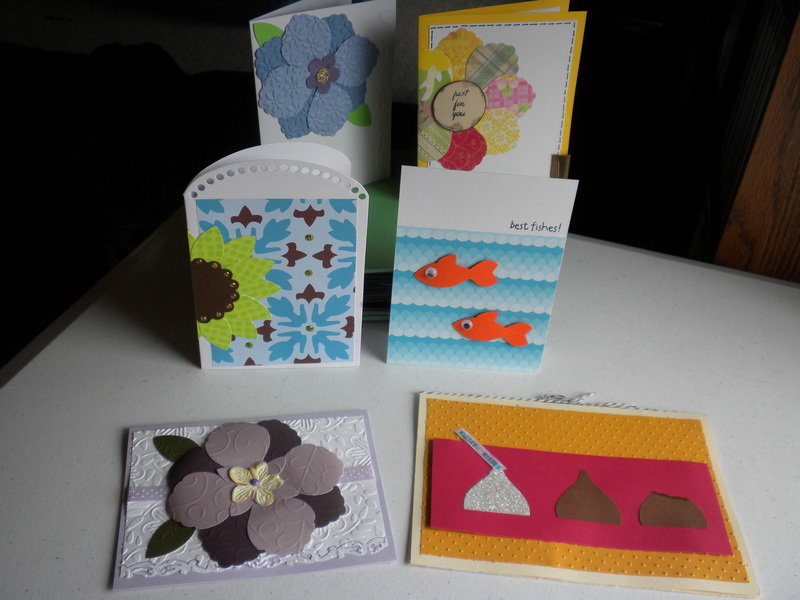 Tena and Jean made flowers, but used embossing folders on the petals. Very elegant! Jodie used hers to do more of a sunflower on the side of the card. Angie did a flower also, but took a chance and made hers patchwork! All very cute! Paula and myself saw the punched parts differently. Paula used part of the largest petal to make chocolate kisses, and then used Crystal Effects to add some “saliva” to the partly eaten one. I used a couple of the smaller petals and turned them into goldfish. The cards all turned out amazing! For August, our challenge is to do “wonky-shaped” cards for any occasion. I can’t wait to see what these clever women come up with!